U10 Greens with coach John van Tiggelen on Day 1 of the new season. The opening match of the year proved to be a stern test for Castlemaine’s 16As against last year’s BASL age group champions, Kyneton. They look to be the benchmark again this year, and despite going down down 8-1, Castlemaine look to have the makings of a competitive squad. Kyneton got off to a fast start showing power, mobility and skill to dominate the first half. Unable to retain possession in the midfield, Castlemaine struggled to make much of an impact as the newly formed squad, and coach, tried to find the right balance of players, positions and touch to counteract the determination and physicality of Kyneton. Nonetheless, even as the team conceded goals, the players began to find some openings – both Tom McCarthy and debutante James Chaffey showed their pace on the wings to break free, James winning a free kick outside the box late in the half. From 25yds Eli Flavell curled the shot over the wall to beat the keeper in the top corner. Castlemaine were harder at the ball, found feet with passes, and began to gel as a group. Bailey worked hard at #9, holding the ball up as striker and defending from the front. Rachel was well tested in goal, as Jasmine had been in the first half, showing sure hands to thwart many shots. She was better protected after the coach adjusted the players to more familiar positions, Zac keeping his composure again and again in central defence, ably supported by Rainer K. and Owen, to delay and stymie opposition forwards. The final score an 8-1 loss, but credit to the players for a spirited final 40 minutes that bodes well for the season. Castlemaine U14As kicked off the season with a strong first outing in the League Cup against Strathdale Jets. Harry Chester opened the scoring for Castlemaine after consistent pressure in their attacking third that produced several chances. Strathdale managed to pull back a goal and absorb the patient build up from Castlemaine. In the second half Castlemaine stepped up their pressure producing a second goal from Harry Chester who was dominant in the attacking midfield role. Further goals were delivered from Cohen Saunders and Dorien Schaerf-Trauner. A second goal arrived for Strathdale and they absorbed a handful of solid chances from Castlemaine late in the half to leave the scoreline at 4-2.
Notable performances from Harry Chester, Tom Broughton and Abel Scopelliti. Castlemaine u14Bs had their first game of the season against the Epson Stingers and showed promising signs for the season ahead. It was a very close match in the first half with both teams matching each other goal for goal. After half time, despite some great play making, good passing and plenty of pressure, the Maine could not put the ball in the net! Epson edged ahead and the final score was 9-4. Plenty of hard work and strong effort was shown by the whole team. More practice, skill development and game experience will see the team improve as the season progresses. Goal Scorers were: Harrison 2; Jimmy 1; Rupert 1. The season opener was a thrilling encounter enjoyed by all. Castlemaine opened the scoring early from open play and held the lead for most of the first half, keeping up pressure in Colts half of the pitch. A penalty to Colts against the run of play late in the first half brought the half-time score to 1-1. Castlemaine scored again from a corner early in the second half and again dominated for most of that half as well. Colts then scored with 4 minutes remaining in the match. Castlemaine pressed hard but the final whistle was blown before they could pull ahead again. Goals: R. De Podolinsky 2. 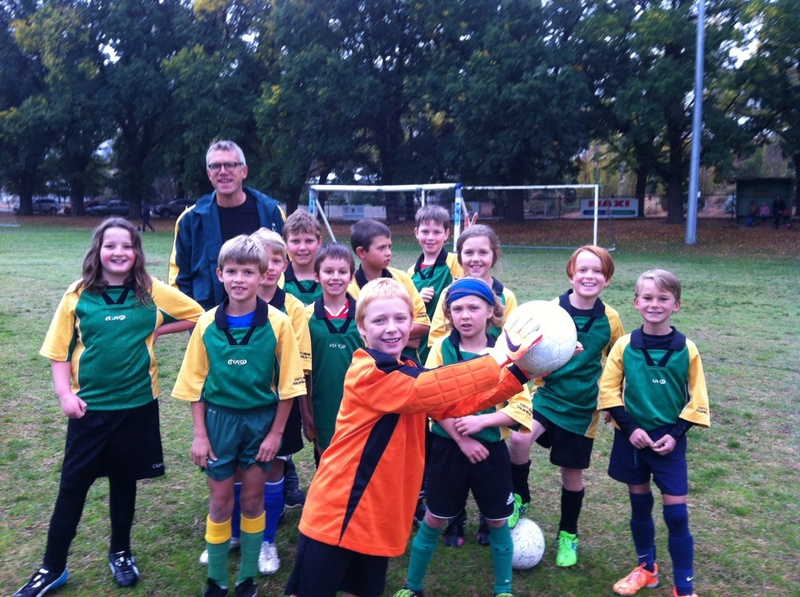 Castlemaine Under 12B made a very bright start to the season on a dull, drizzly Saturday morning in Chewton. Marauding runs by Miro Vaskess and Mischa Thackray caught the eye, Sam Butterworth-Moss was unrelenting at the ball and fellow midfielder Fionn Kennedy forever found space to exploit. Peggy Ross and Kane Bassett were pushed forward where Himal Gautam regularly used his pace to take the ball deep into attack. Elouise Jones and Daniel Hall both made impressive debuts for Castlemaine. Castlemaine’s goal was well protected by a highly organised and committed defence; Jack Neilson-Bridgfoot, Rosie MacLaurin and Monty Hall used speed and cunning to maintain a high defensive line. A patrolling Remy Sartori also proved too quick for Colts’ attackers and Obie Adam’s distribution was a joy to behold. Hugh O’Connor found the net in the first half before keeping a clean sheet in the second. His fellow keeper, Henry Tremlett-Davies, also remained unbeaten in goal before forcing a spectacular save from the Colt’s keeper with a shot from well outside the box. Castlemaine won convincingly, 8 – 0. Goalscorers: Miro Vaskess (2), Mischa Thackray (3), Himal Gautam (2) and Hugh O’Connor (1). The untried might of Castlemaine Gold tried, tried and tried again early on Saturday morning against the Spring Gully Reds. Not for lack of effort did they go down 4-1, and bar a few mad goal line scrambles, and had Rain been able to beat a very able keeper after beating three or four and running the length of the ground a few times, it could have been so much closer. Ethan was strong in goal in the first half and added a touch of class and run in the outfield in the second. Archie filled the goal with aplomb in the second half and made many a fine save. The defence was tested, and blocked numerous attacks. Michael and Ollie, put their bodies on the line and often got the ball to teammates upfield. Gianluca marshalled the defence and made grand runs upfield to be a dangerous attacker but always made it back. Harry and Henry were strong wherever they played (in defence or midfield mostly but with a rapid rotation system, were called upon to fill in up forward as well). Oscar and Ronan were committed and made great defensive runs, while Alby controlled the centre of the park distributing passes out wide. The great moment of glory was Rain’s wonderful knee slide goal celebration where he nearly ran as far after the goal as he had before when he came from his own half, beat two defenders to slide it past their desperate keeper. Castlemaine Green hit the ground running in its debut against the Spring Gully Red Flames on Saturday morning. The Flames put up some spirited resistance, especially in the second half, but possibly the solid pre-season for many of the Swift Parrots made the difference. The way the Parrots combined and pressed (and celebrated!) you’d never have guessed they were a fledgling outfit representing seven different schools: indeed the Green looked anything but green. Goals: Monte opened the scoring with two in four minutes, Louis bagged a hat-trick and Ciaran, Silas and Jack also scored: 8-0. Best players (in no particular order): Jack, Dimitri, Eva, Tom, Grif, Elliot, Finn, Ciaran, Louis, Aidan, Monte, Silas.